The Complete Peanuts 1985-1986, volume 18 of Fantagraphics' reprint series of the Peanuts comic strip, is now shipping from Fantagraphics. This collection includes all the comic strips from 1985 and 1986 and an introduction from comedian and actor Patton Oswalt. The latest two-volume box set, The Complete Peanuts 1983-1986 Gift Box Set, which includes both Volume 17 (published earlier in 2012) and the just-released Volume 18 together in a special slipcase, is shipping as well. Both the individual book and the box set are also available now from your local comic book store, or can be ordered from Amazon or other book stores. Some of the highlights of the 1985-1986 volume: the Peanuts gang encounters Halley's Comet, go to "rain camp" and "survival camp," and meet new character Tapioca Pudding; Peppermint Patty wins the “All-City School Essay Contest” with her “What I Did During Christmas Vacation” essay; and Snoopy accidentally does in his dog house with a cannon. 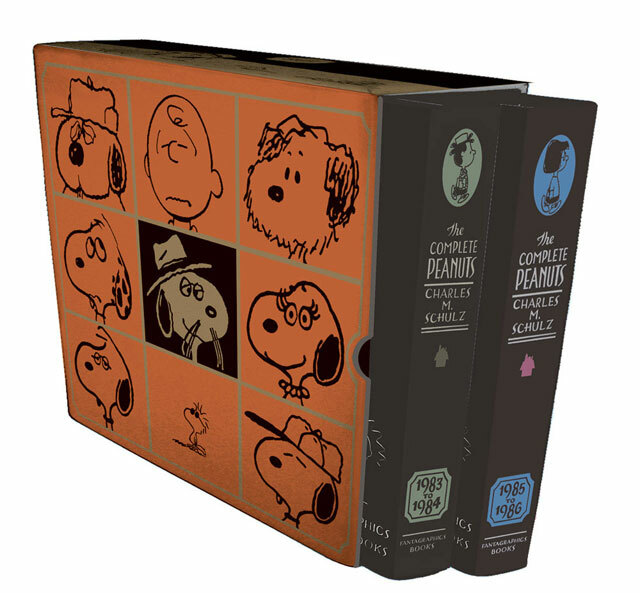 For a 16-page preview, photos of the box set slipcase, and more information, visit the Fantagraphics website's pages for The Complete Peanuts 1985-1986 and the The Complete Peanuts 1983-1986 Gift Box Set. On Thursday, August 15, 2002, the Charles M. Schulz Museum and Research Center opened to the public amid great fanfare. The star-studded guest list included numerous cartoonists and animators — among them Patrick McDonnell (Mutts), Greg Evans (Luann) and Sergio Aragones (Mad Magazine) — along with Peanuts-type celebrities such as Robert Short, author of The Gospel According to Peanuts and several other books. One noted special guest was Yoshiteru ("Yoshi") Otani, whose whimsical sculptures, designs and other efforts for various Snoopy Town Shops in Japan had helped inspire the new Schulz Museum's overall look. Please bloggers were present as well, along with literally hundreds of Peanuts fans who couldn't wait to be among the museum's first visitors. The gift shop already was laden with plenty of books, plush Snoopy dolls — wearing museum T-shirts, of course — and other items designed to commemorate this event. 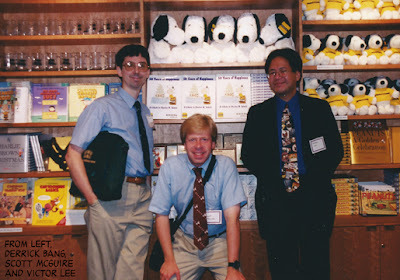 Scott and Victor also were among the contributing writers for Derrick's first book, 50 Years of Happiness: A Tribute to Charles M. Schulz ... and you can see them standing in front of an entire shelf filled with copies of this book. They're quite pleased by the fact that the book has remained available in this same gift shop ever since, where it remains a steady seller. Flash-forward a decade, to Saturday, August 18, 2012: the weekend designated to celebrate the museum's 10th anniversary. Some things have changed over the years, such as the museum's staff, in part because it has grown so much. But the core message remains fixed: the celebration of Charles M. Schulz's work, and the dedication toward keeping his vision alive through an ever-changing assortment of imaginative and cleverly designed exhibits, many of which also have toured the country with stops at other museums. The festivities began at 11 a.m. with a "cherry tree ceremony" designed to honor both the museum's anniversary, and Otani's artistic contributions and ongoing devotion to its mission. The ceremony also held a greater purpose: as part of the 2012 Japan-U.S. Centennial Cherry Blossom Tree Planting Initiative, to further enhance the friendship between these two countries. The centennial celebration looks back to 1912, when — to express appreciation for the United States' partnership in that year's Treaty of Portmouth, Japan sent 3,020 cherry trees from Tokyo, to be planted along the Potomac River in Washington, D.C. Cherry blossoms — sakura — are Japan's national flower. Roughly 50 people gathered in the Schulz Museum's front courtyard on this warm August morning, where they found a young cherry blossom tree carefully wrapped for the ceremony, and planted alongside the Snoopy Labyrinth. The small but dedicated group included quite a few folks who had traveled all the way from Japan, along with (sadly) only half of your FiveCentsPlease team. Jeannie Schulz and museum director Karen Johnson gave short introductory speeches, and Jeannie presented Otani — also present for the occasion, once again wearing the eye-catching white "Snoopy jacket" that had prompted so many photographs, back in 2002 — with a lovely sculpture by Stan Pawlowski, another artist who has been a longtime friend to the Schulz family and the Peanuts empire (and whose full-size bronze statue of Charlie Brown and Snoopy continues to draw tourists to Santa Rosa's nearby Railroad Square). A proclamation then was read aloud by San Francisco's Deputy Consul General of Japan, Michio Harada, who spoke warmly of the ongoing friendship between his country and the United States, and between Otani and the Schulz Museum. He also explained the significance of cherry trees, and the annual celebrations that take place in Japan each spring, when people have picnics beneath the flowering trees, the goal being to eat good food, drink plenty of sake and reflect upon life's blessings. 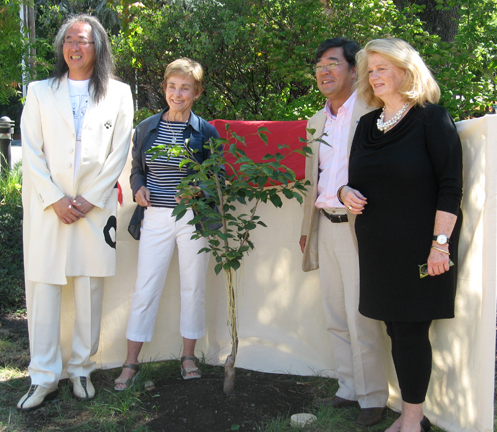 Following these remarks, the ends of the tree's robe were pulled by Jeannie, Karen, Yoshi and Deputy Consul General Harada, and the tree was "introduced" to the world (or at least that small portion of it present as witnesses). All four obligingly stood during a multitude of photos, and then we all broke into informal groups (and, in several cases, for a quick lunch at the nearby Warm Puppy Café). 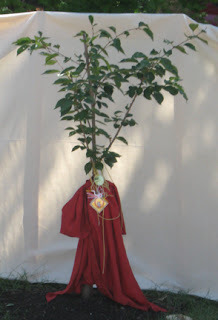 On Saturday August 18, first at 11 AM, the Museum will hold a cherry tree ceremony in honor of Otani and his artistic contributions to the Museum. Next, at 1 PM, Otani will give a live brush painting performance accompanied by Japanese Taiko drummer Rin Matoba, then will meet visitors and sign autographs. The Peanuts comic book from Boom Studios returns to comic book stores on Wednesday, August 15 with the first issue of another 4 issue run. Confusingly, the new issue is numbered as #1 again; but if you consult the small print inside, you'll see that it is "Volume 2, Number 1." 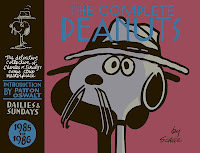 It can also easily be identified by the cover featuring a beach scene with the Peanuts gang. 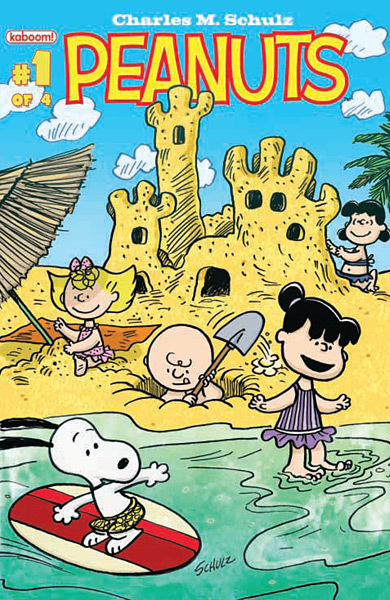 The comic book features all-new content with three stories - "Sun Tan Hero," "Brush with Disaster," and "How to Draw Linus" - and a few classic Peanuts comic strips. For a preview of the issue, visit Comic Book Resources. Like the previous batch of Peanuts comic books, these four issues will be available with variant covers featuring the first appearance of one of the Peanuts characters. Not all comic book stores will stock the variant covers, and they carry a premium price. You can order both the regular and variant version of the comic directly from Boom Studio's website as well. In addition to the new Vol. 2 #1 issue, the trade paperback collecting all four issues of the Peanuts comic books released earlier in 2012 is now available. 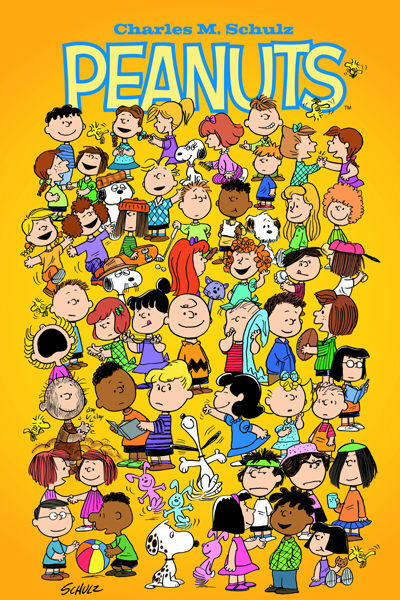 Titled Peanuts Volume 1, it includes all the stories and classic Peanuts strips from Peanuts Vol. 1 #1-4 and the special preview issue Peanuts #0. For those who already have all those issues there isn't much new in the trade paperback - it features a new cover and reproductions of both the regular and variant covers of the Volume 1 issues (although they're only reproduced at quarter size). But if you didn't pick up the separate issues, the trade paperback is a nice package and somewhat cheaper option for getting these new Peanuts stories. The Peanuts Vol. 1 trade paperback shipped to comic book stores a few weeks ago, or can also be ordered from Amazon or other book retailers.